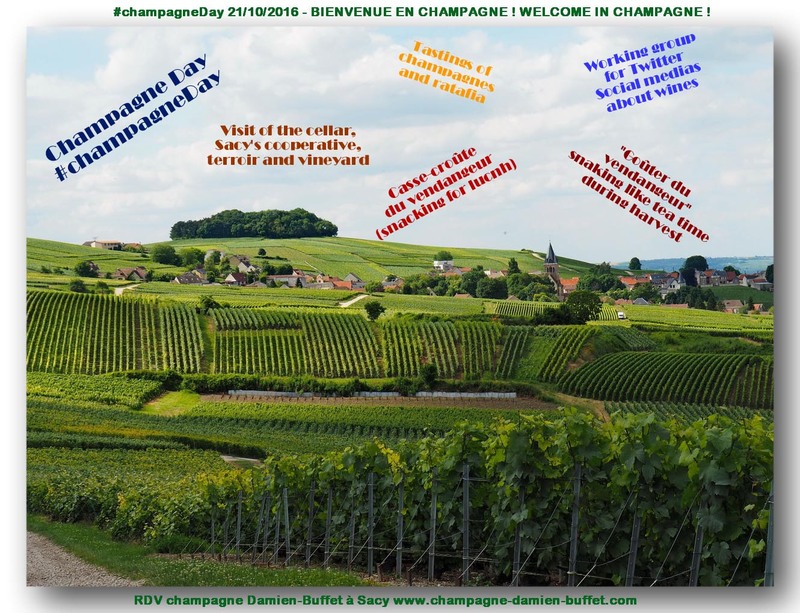 TAKE PART OF CHAMPAGNE DAY’S EVENT #champagneDay on social media on october 21 ! Each year we take part on Twitter, through social medias, at an event named #champagneDay . More and more people around the world are sending photos, sharing their tastings moments. It’s a nice way to discover many champagne lovers, share our passion. 8:45 RDV 12 Chatillon’s street at champagne Damien-Buffet’s House who you’ll be warmly welcome. 9 to 10A M Visit. We’ll show you Champagne terroirs, cooperative of the village, differences between cuvees, how we take care of our vineyard, how we produce and choice our wines to create our champagnes cuvees and ratafia. 10 AM to 12 AM tasting of three cuvees of our champagnes and ratafia of Champagne from our winery champagne Damien-Buffet and what we call “casse-croûte du vendangeur” for eating like our lunch during the harvest. For those who know how to use Twitter, other social medias and want to share your #champagneDay moments, it’ll be greatly appreciated. 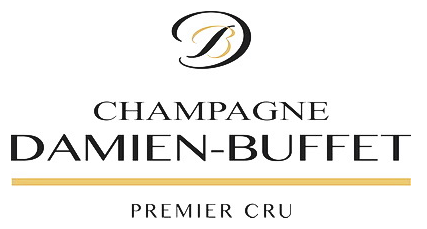 2:45 PM RDV 12 Chatillon’s street at champagne Damien-Buffet house who you’ll be warmly welcome. 3 to 4 PM visit. We’ll show you Champagne terroirs, cooperative of the village, differences between cuvees, how we take care of our vineyard, how we produce and choice our wines to create our champagnes cuvees and ratafia. 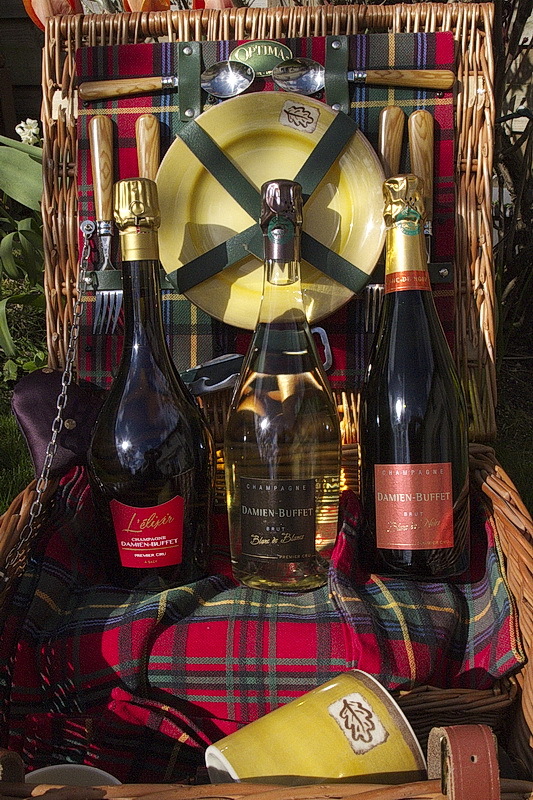 4 to 5:30 PM tasting of three cuvees of our champagnes and ratafia of Champagne from our winery champagne Damien-Buffet and what we call “goûter du vendangeur” it’s a snack like those we have during the harvest. Price 38 € per adult (in France it’s prohibitied to propose and pour some alcohol to young under 18 years old). If you are with your family it’ll be free for children under 12 years old and the price will be 25 € for young from 13 to 18 with the snaking and beverage without alcohol. See you soon in Champagne to welcome you ! If you want some help to stay and discover more in our Champagne region, ask and we’ll try to help you with pleasure. Sacy is a small village 1er cru of Champagne, at a few kilometers from Reims, a bit more from Epernay and near a natural regional park. So you can come easily by plane then by speed train (TGV) 45mns from Paris to Reims or from Belgium or Germany by car or train. In general if you are interested to visit us and search a place to sleep, we propose guest-rooms. We can prepare and book a tour or a visit of our winery for a group of 8 persons or more. Under this number we cannot have enough free time for individual visits, but call, perhaps we’ll have other persons who are searching for the same period than you and would like to be enough to book a visit.